Chris Barns, also known as Brolga or Kangaroo Dundee, rescued Sebastian and Madeline after they became orphaned. 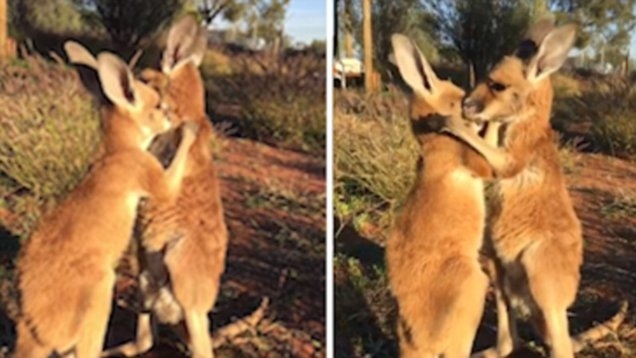 Sebastian and Madeleine were rescued after they became orphans and now reside at the The Kangaroo Sanctuary in Alice Springs, Northern Territory. Sanctuary rescues, rehabilitates and releases orphaned baby kangaroos back into the wild. Those who can’t be released into the wild are released into the wilds of our 188 acre Sanctuary. Just like children and the young of countless other species, little kangaroos very much need comforting contact with others. Those two roos, fortunately, have each other to cuddle whenever they feel like it – and feel like it they do, all the time! Their sweet little hugs are bound to bring a smile to every face. Madeleine and Sebastian are best friends and are together practically always, with no chance of ever feeling lonely – they very visibly enjoy each other’s company, perhaps more than anything else. With all that hanging out together, it seems like they even managed to synchronize their belly-scratches! Responses to "Rescued baby kangaroos have the cutest cuddling and scratching routine"